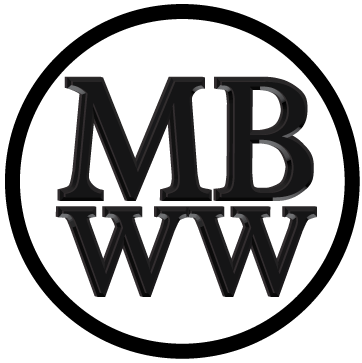 No-Watch is a watch company from Greenwich UK started in 2012 that primarily specializes in single hand, single hand backward and 24 hour watches. 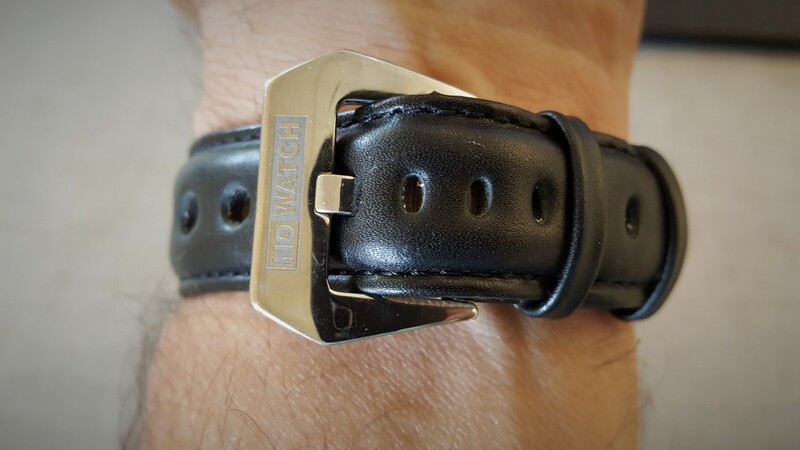 For this review I have their 24 hour CL1-1212, a sport casual watch made in a limited run of 750 pieces, my example being number 55. Besides telling the time in a somewhat different format, the watch is a high quality piece that doesn’t disappoint. The watch uses a Swiss made Ronda 515.24H quartz 1 jewel movement that has a 45 month rated battery life and is expected to be accurate to -10/+20 seconds per month. My example is well under a second a day fast. 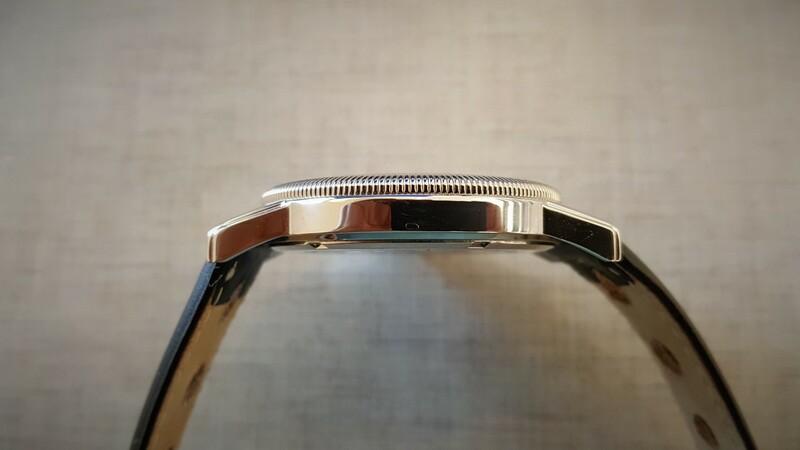 The watch case is 316L stainless steel, beautifully polished everywhere except for the tastefully engraved portions of the screw down back. Measuring 44 mm by 9.5 mm, this is a large watch that fits my 7 inch wrist comfortably. 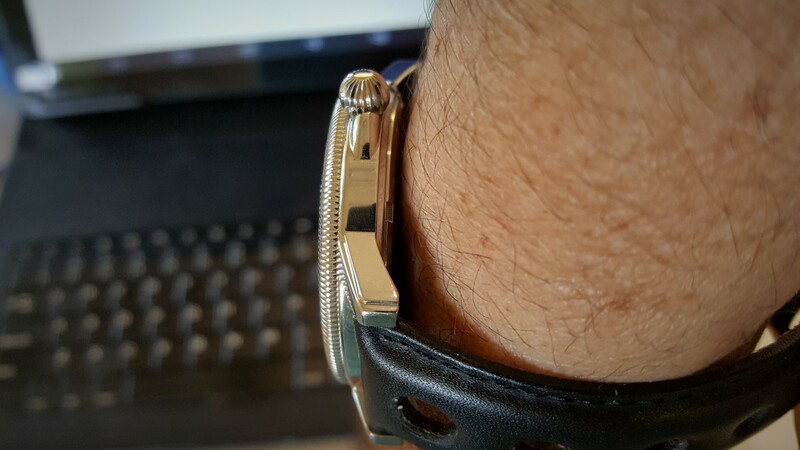 Lug to lug, this watch is 52 mm. 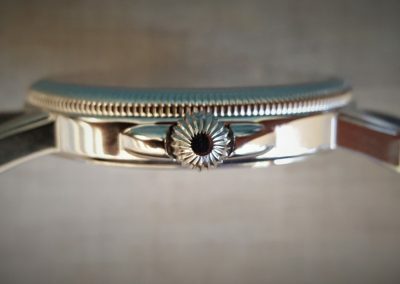 The stepped down slightly curved lugs blend well with the polished quarter circle coin edge bezel, screw down 5 x 3.8 mm onion crown and the polished curved crown guard. 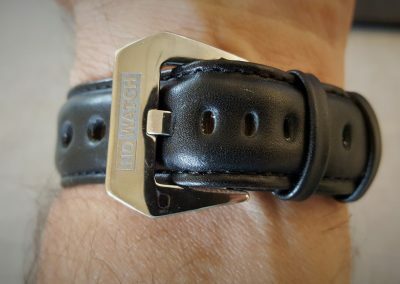 The 22 mm soft black leather strap has an automotive theme with racing style lightening holes and a large polished and signed stainless steel buckle. 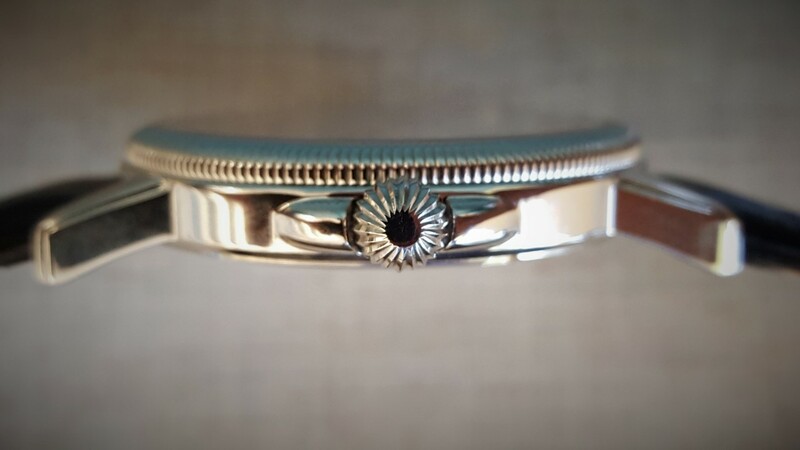 The slightly raised flat sapphire crystal works perfectly with this case and face. 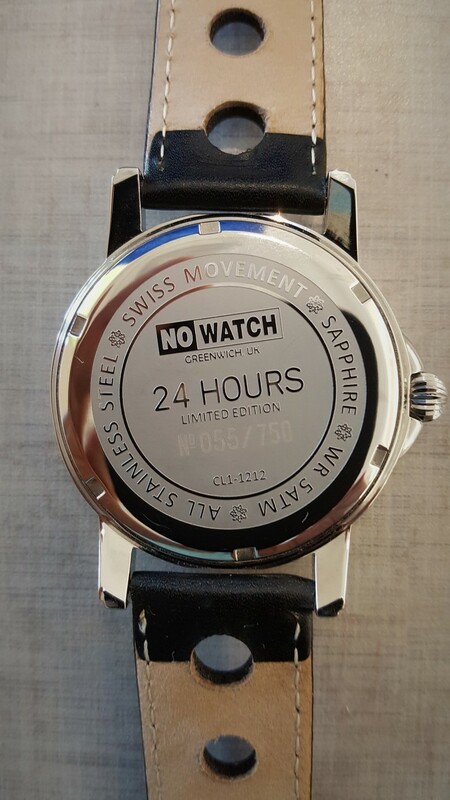 The face of the watch is completely flat with no raised indices and has numbers at all 24 hour points except for 12 am, 12 pm, 6 am and 6 pm, which are large dive watch type lumed triangles. Only these four triangle markers, the black outlined hour and minute sword hands and the long sword second hand (with black tail) are lumed. The dial is divided into three sections; black with white lumed numerals from 10 PM to 6 AM, gray with white lumed numerals from 6PM to 10PM and silver with black numerals from 6 AM to 6 PM. The railroad track minute/second chapter ring is split 50/50 in black/white and works perfectly with the black tailed second hand, even if there is some typical quartz watch second hand misalignment. 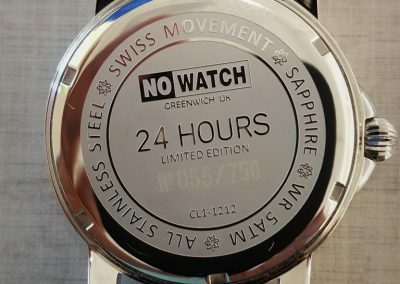 The “NO WATCH” name/logo and the word “SAPPHIRE” are printed on upper and lower portions of the face, respectively. Basically the hour hand of the watch covers all 24 hours in one full sweep of the dial and the minute and second hands function normally. 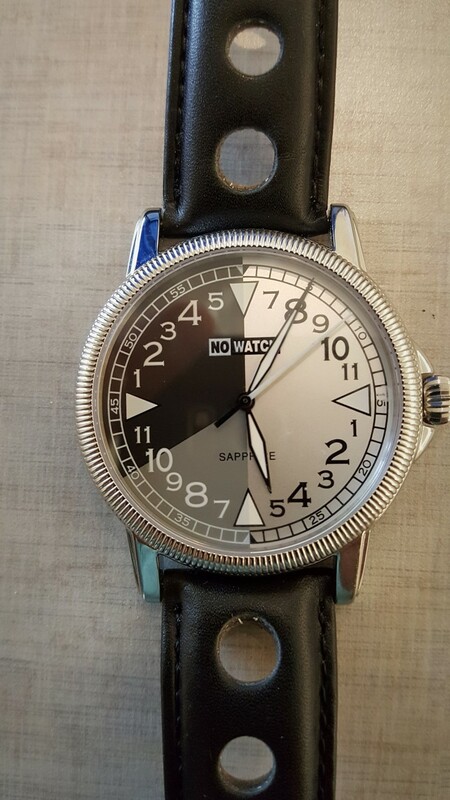 Since normal analog watches don’t indicate AM or PM, this is a good watch to wear for people in places for long periods that lack normal day or night references. 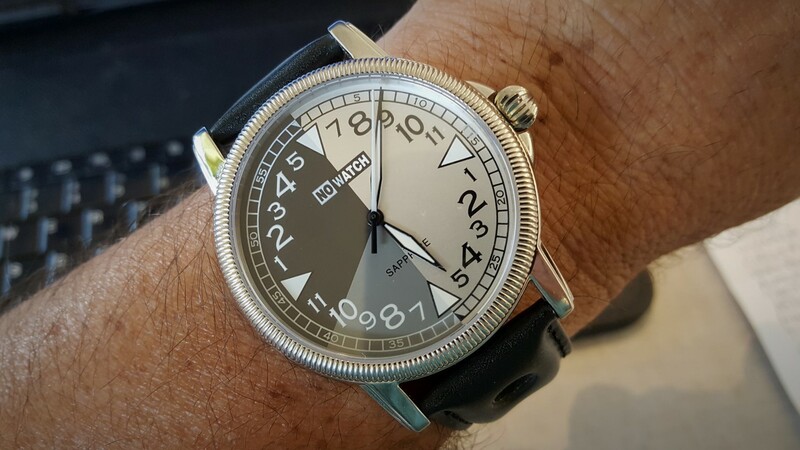 Buildings with very few windows (such as casinos in Las Vegas), underground facilities and extreme locations near the North or the South Poles are good examples where this type of analog watch might be useful. 24 hour watches do make sense, even if they make the wearer take a few more seconds to read the time. 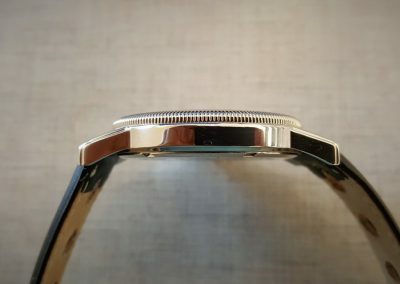 With quality and attention to detail, the NO WATCH CL1-1212 is an excellent example of an intelligently designed and manufactured 24 hour type of watch. This watch is currently available for $109.90; $250 is retail price. 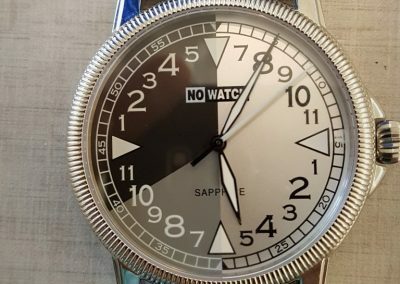 no-watch.co.uk or svalbard.one or listed resellers. 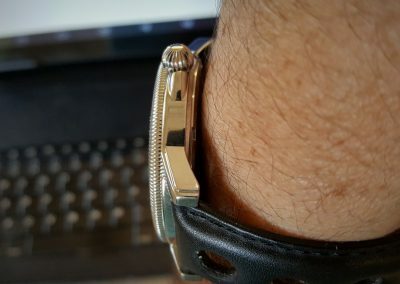 Good review of an intersting watch. Personally, I would have liked the use of “24 hr – Mil time” numbers on the dial.